A rendering of the proposed stadium for the San Francisco 49ers. The Hunters Point/Candlestick redevelopment's draft environmental impact report for Phase II went online Thursday. And it bets on the San Francisco 49ers alleged move to Santa Clara not being a sure thing. The project, which encompasses a total of about 790 acres in the southeastern portion of the City, is so huge it's about twice the size of Treasure Island, which incidentally is also supposed to get redeveloped by Lennar. Phase II follows the comparative drop in the bucket of Phase I, in which the 247 condos as first described in April and in another render reveal just a couple weeks ago belong. The impetus behind the massive redevelopment: pumping life back into the southeastern portions of the City (cough: Bayview) via 10,500 homes and an infusion of 24,465 residents with which to jelly-fill those donuts. And still key to the plan is a 49ers stadium, located in Hunters Point rather than its current Candlestick spot. "A major component would be a new stadium for the San Francisco 49ers National Football League team," the six volumes and thirty-eight part report admits. The proposed stadium is a a 69,000-seat jewel for the once glorious franchise. But the plan also calls for "a 75,000 gsf performance arena," which could mean the football stadium is use almost exclusively just for football. 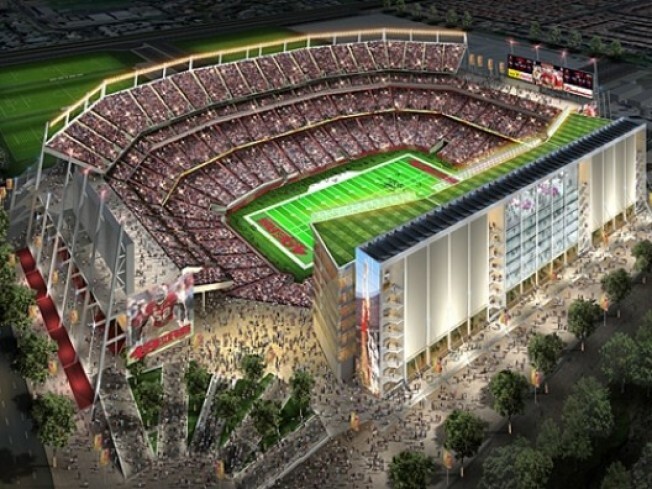 Will it be enough to keep the 49ers in the City, even as they negotiate with Santa Clara on moving their stadium there? That remains to be seen— if the Hunters Point stadium falls through, Lennar and San Francisco will simply fill in the hole with more housing and offices. Construction on Phase II — an estimate, mind you — could go from 2010 through 2023. During that span of time, 10,000 trees will be planted, and 336 acres of new and rehabbed park and open space will be created (including the football stadium). The tab for all this: $2 billion.